I designed this project for the Creations in Miniature online group, the cyber meeting place founded by my dear friend Lenora B. Smith for miniaturists who enjoy participating in group projects and swaps. She is assisted in keeping the group running smoothly by another dear friend, Pat Kasell, and Yours Truly. 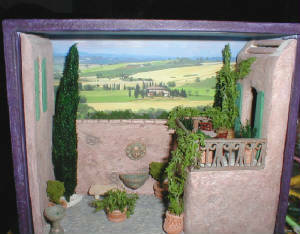 Although I decided to create the prototype of the Tuscan Courtyard in 1:48 scale, members are encouraged to work in their preferred miniature scale, so it should be tons of fun seeing how many different versions and scales of this project will be created as a result. This is a work in progress, so I will be updating this site as I proceed with the project. If you have any questions fell free to post to the list, or send me an e-mail.